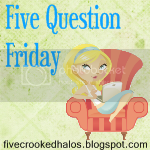 Joining up with Mama M. from My Little Life today for Five Question Friday. 1. What was the first car you owned? A black chevy corsica with red pin stripes. 3. Have you ever had stitches? Yes after I had my first baby. I have never needed them for anything else though. 4. What was your first job? I taught piano lessons for a year when I was 15 or 16. 5. Who is your favorite Sesame Street character? I like them all really, okay if you are really going to make me choose I guess Cookie Monster. I love that he eats everything in site and everyone just expects that from him!